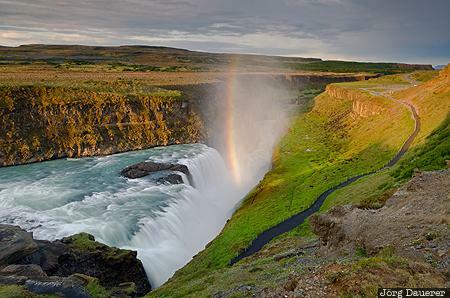 The water of the river Hvítá falls down the cascades of the waterfall Gullfoss and the low morning sun creates a rainbow in the spray of the waterfall. Gullfoss is in Suðurland in the south west of Iceland. This photo was taken in the morning of a sunny day in June of 2012. This photo was taken with a digital camera.